disulphride bridge in the A chain. Secretion of insulin is mainly controlled by plasma glucose concentration, and the hormone has a number of important metabolic actions. 1st principal function is to control the uptake and utilization of glucose in peripheral tissues via the glucose transporter. This and other hypoglycemic activities, such as the inhibition of hepatic gluconeogenesis and glycogenolysis are counteracted by the hyperglycemic hormones including glycogen, epinephrine (adrenaline), growth hormone and cortisol. Insulin concentrations are severely reduced in insulin-dependent diabetes mellitus (IDDM) and some other conditions such as hypopituitarism. Insulin levels are raised in non-insulin-dependent diabetes mellitus (NIDDM), obesity, insulinoma and some endocrine dysfunctions such as Cushionâ€™s syndrome and acromegaly. 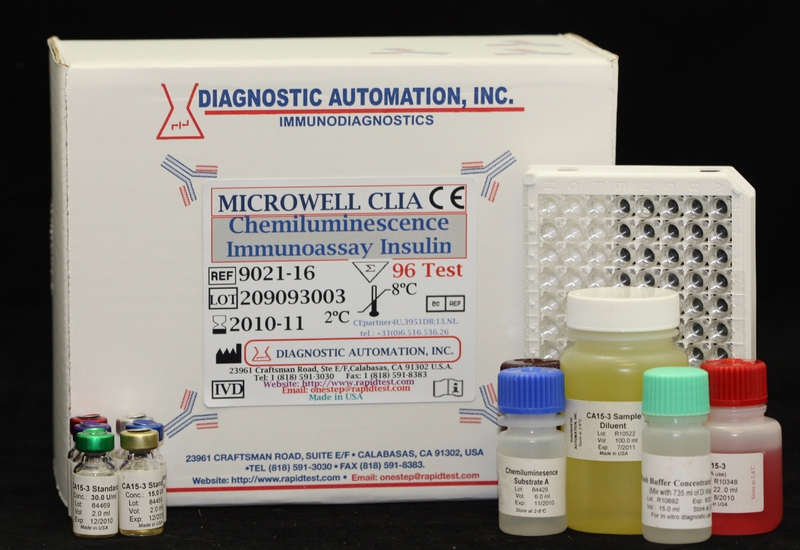 The Insulin Test Kit is based on a solid phase enzyme-linked immunosorbent assay. The assay system utilizes one anti-Insulin antibody for solid phase (microtiter wells) immobilization and another anti-Insulin antibody in the antibody-enzyme (horseradish peroxidase) conjugate solution. The standards and test specimen (serum) are added to the Insulin antibody coated microtiter wells. Then anti- Insulin antibody labeled with horseradish peroxidase (conjugate) is added. If human Insulinis present in the specimen, it will combine with the antibody on the well and the enzyme conjugate resulting in the Insulin molecules being sandwiched between the solid phase and enzyme-linked antibodies. After a 1-hour incubation at room temperature, the wells are washed with water to remove unbound labeled antibodies. A solution of chemiluminescent substrate is then added and read relative light units (RLU) in a Luminometers. The intensity of the emitting light is proportional to the amount of enzyme present and is directly related to the amount of INSULIN in the sample. By reference to a series of INSULIN standards assayed in the same way, the concentration of INSULIN in the unknown sample is quantified. without additives. Allow the blood to clot. Centrifuge the specimen to separate the serum from the cells. thawing. When assayed in duplicate, 0.100ml of the specimen is required.